A Mighty Fortress is our God, A Trusty Shield and Weapon. He helps us free from every need, That hath us now o'ertaken. The old evil Foe, Now means deadly woe. Deep guile and great might, Are his dread arms in flight. ON EARTH IS NOT HIS EQUAL! With might of ours can naught be done, Soon were our loss effected. But for us fights the Valiant One. Whom God Himself elected. Ask ye, Who is this? Jesus Christ it is. And there's none other God. HE HOLDS THE FIELD FOREVER! Tho' devils all the world should fill, All eager to devour us. ONE LITTLE WORD CAN FELL HIM! The Word they still shall let remain, Nor any thanks have for it. He's by our side upon the plain, With His good gifts and Spirit. And Take they our life, Goods, fame, child and wife. Let those all be gone, They yet have nothing won. THE KINGDOM OURS REMAINETH! Amen. 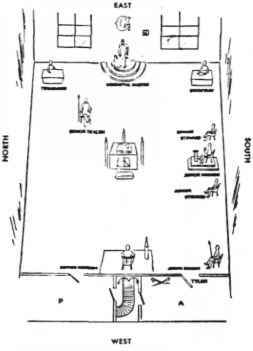 Floor plan of Masonic lodge indicating position of officers. Masonic candidate prepared to receive the first or Entered Apprentice degree. THE MASONIC TEACHING Masonry teaches man to practice charity and benevolence, to protect chastity,* to respect the ties of blood and friendship, to adopt the principles and revere the ordinances* of religion, to assist the feeble, guide the blind,* raise up the downtrodden, shelter the orphan, guard the altar,* support the Government,* inculcate morality,* promote learning, love man, fear God,* implore His mercy and hope for happiness. *Asterisk denotes brazen lies about the actual beliefs and practices of Freemasonry, which are often opposite to what is stated here for public consumption. The Editor refers readers to the literature on Freemasonry cited in Christian Revolt, Long Overdue, his comments in that work, and particularly studies by the Lutheran Pastor Martin L. Wagner, Freemasonry: An Interpretation, and knowledgeable criticism of a former 33° Mason, Rev. Jim Shaw, The Deadly Deception: Freemasonry Exposed ... By One Of Its Top Leaders. "America is known as a nation of 'Joiners.' So eager are many Americans to belong to something that they become members of an organization merely because the name of a friend or some famous individual is linked with it. Subversive organizations are known to have built their membership rosters by the practice of listing on their letterheads the names of successful persons who have carelessly lent their reputations to a supposedly good cause. There is scarcely a human interest or activity for which a society has not been organized. Oftentimes such organizations have exploited their members for the personal profit of their enterprising founders. The questionable record of many 'fly by night' concerns should serve as a warning to all Christians not to join any organization without previously having carefully examined its objectives and record. "Particularly is this the situation in the field of morality and religion. 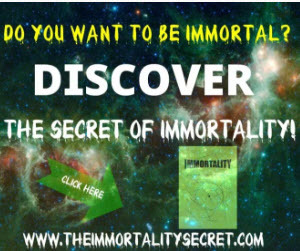 Here, too, there are numerous orders and societies which attract the unwary by claims of ex-clusiveness or programs for moral improvement. But in their activities many such organizations violate Scriptural principles and conflict with the duties of church members. Accordingly, every faithful Christian when tempted to join some secret order or exclusive club should carefully ascertain whether it has any objectionable features before becoming a candidate for membership. Considerations of personal advantage or special privilege dare not tip the balance if religious features and the program of a club or lodge do not square with Scriptural teaching and precept. "Many well-meaning Christians have become confused by such arguments and have been led to doubt that their pastor and their church actually were in possession of the facts about the lodge when they criticized it. Masonry attracts the better regarded people of the community. "In the old days practically all lodges were deistic, pagan, and anti-Christian. It was a simple matter to produce the evidence from the lodge rituals. Every member was received through initiation, and at the initiation he was obligated to the ritual. That made it comparatively easy to get at the conscience of the lodgeman and to convince him that he should sever his connection with the lodge, that it was inconsistent for him to belong to the lodge and to the Church of Christ at the same time. You could quote Bible passages to convince him that the lodge oath was sinful. You could show him that the worship of the lodge was pagan and that the teachings were anti-Christian. You could show him that he was guilty of denying Christ, etc. And if you were dealing with a Christian, you were almost always successful in getting him out of the lodge. 2Theodore Graebner, A Handbook on Organizations, (St. Louis: Concordia Publishing House, 1957), pp. 19,20.
cient evidence for the character of the latter. "...When Freemasonry became 'Speculative,' it changed from trinitarian to deistic forms of worship and eliminated the name of Christ from Scripture passages and from its prayers, retaining the brotherhood of man and the fatherhood of God and the immortality of the soul, as religious doctrines and offering these truths of religion, clothed in symbols, to those who come to its altars. The Bible is only one sacred book among many; the Lodge rejects the notion that the religion of the Bible should possess a unique pre-eminence over the religion of other sacred books. Jesus Christ is not acknowledged as Savior, and the promise of eternal bliss is held out to all who follow the ethics of the Masonic Lodge. It is not possible to express the dependence on good works with greater definiteness than is done in the ritual of the Blue Lodge (the three degrees of Entered Apprentice, Fellow Craftsman, and Master Mason). "...Due to the Wesley an Revival in England and the Great Awakening in the United States, with the influence of Protestantism still giving character to national life, Christianity, especially in the United States, was too strong to permit either Freemasonry or Oddfellowship to stress their deistic or anti-Church attitudes. 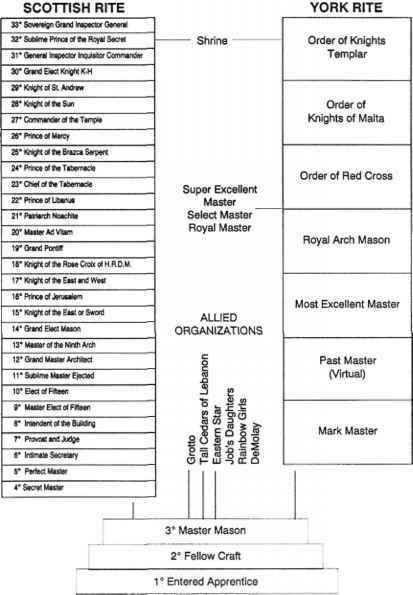 While frankly anti-Christian in its French, German, and Italian branches, Freemasonry in England and the United States has always called itself a supporter of the morality and doctrines of Protestant Christianity. Very few candidates realize that they are joining an organization which is essentially antagonistic to the Christian belief in the inspiration of the Bible and the deity of Jesus Christ. Even in the more advanced degrees (of the American Rite, the Scottish Rite)1 and in the Mystic Shrine with its Mohammedan ritual, the anti-Christian features are only realized by those who make an independent study of the ritual and of the literature written by the spokesmen of the Order. It is the pledge of a blissful hereafter coupled with the absence of all reference to repentance and to faith in Christ's atoning work, that has opened the eyes of many to the iniquity of Freemasonry. 1The American Rite consists of seven degrees (4th-10th); associated with it are three additional honorary degrees (11th-13th). The Scottish Rite consists of twenty-nine degrees (4th-32nd); associated with it is one additional honorary degree (33rd). 2"Freemasonry," Lutheran Cyclopedia (St. Louis: Concordia Publishing House, 1954), pp. 391-392. 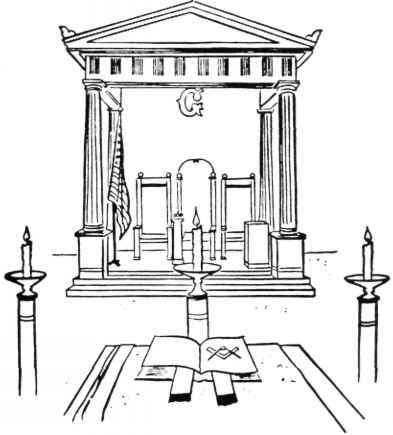 (d) And finally, many Lutherans do not know why many Lutheran Church bodies, including the Lutheran Church - Missouri Synod and the Wisconsin Evangelical Lutheran Synod, are opposed to Freemasonry. In discussing any secret society or fraternity such as Freemasonry, the first question that must be answered is: Is the secret society or fraternity a religious institution? If the answer to this question is in the affirmative, then, as it has been stated before, it is necessary for the Church to pass judgment upon that secret society or fraternity.